It’s the time of the year again! Are you ready to send away the Year of Dog and welcome the prosperous Year of Pig in 2019? PartyMojo sure is prepared and we can’t wait to jubilate this festive season with you, your family and community! Celebrate with PartyMojo with an exuberant mix of vibrant colours as well as age-old traditions! Discover the Chinese New Year traditions, activities, symbolic dishes and breath-taking performances all with us! *Promotional Price only valid from 5 Feb 2019 to 15 Feb 2019! Burning for some exploding beats to enter the new Year of Pig? Look no further! PartyMojo’s Chinese New Year Huat Huat Lion Dance Package hears your calling! Blast into the Chinese New Year with prospering sounds of the Lion Dance! Our package offers a 30-minute Lion Dance performance by 2 Lions with a team of 8 men! Needless to say, a full percussion team to boost the energy at your Chinese New Year event this year accompanies the Lion Dance! 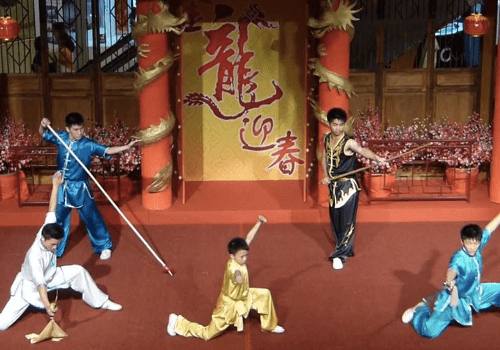 Be it a private Chinese New Year house party with friends and family, a corporate event in the office, or on a stage, our 10-years experienced Lion Dance crew will blow you off! 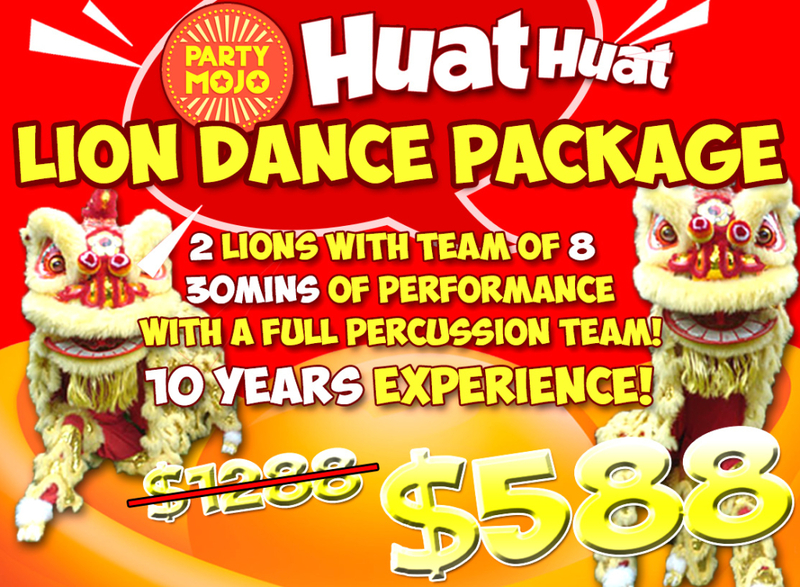 Call PartyMojo’s personnel now, to inquire on our Huat Huat Lion Dance Package for your event! May all the great fortune come your way this year, Gong Xi Fa Cai! *Promotional Price only valid from 1 Jan 2019 to 28 Feb 2019! 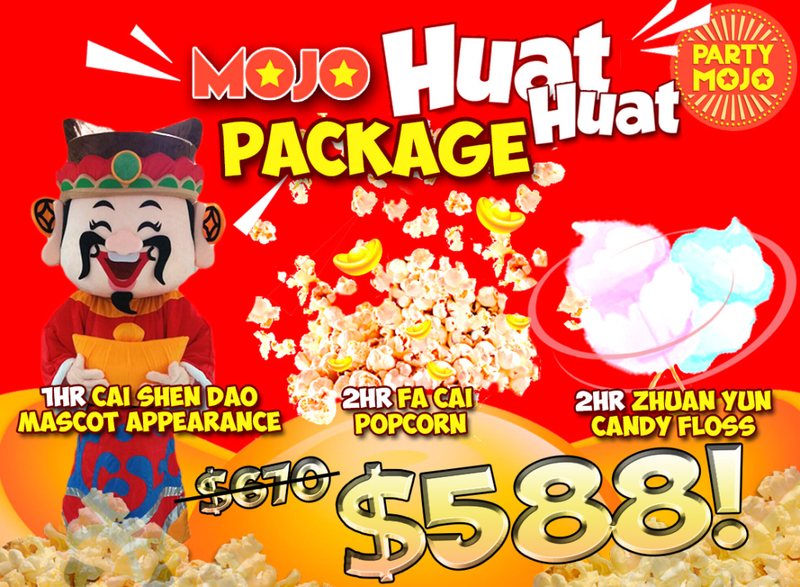 PartyMojo’s Mojo Huat Huat Package is the Chinese New Year offer you MUST grab this year! Kick off 2019, the Year of the Pig with PartyMojo’s yummy Mojo Huat Huat Package! This CNY package combines only the best prospering deals for everyone! 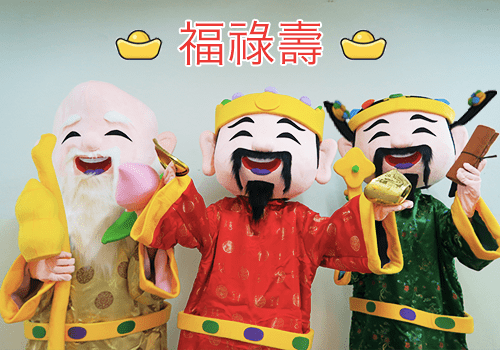 Invite The God of Fortune aka Cai Shen Ye to descend upon your event for one full hour and bring about prosperity, fortune and golden opportunities along your way throughout the year! This is accompanied by 2 hours of free-flow Golden Popcorn and 2 hours of free-flow Fortune Candy Floss! Revolve every chance that comes your way into great fortune and plentiful prosperity! Reach out to PartyMojo now and Huat the all the way from that start of the year until the end of the year in 2019! You asked for it, YOU GOT IT!! 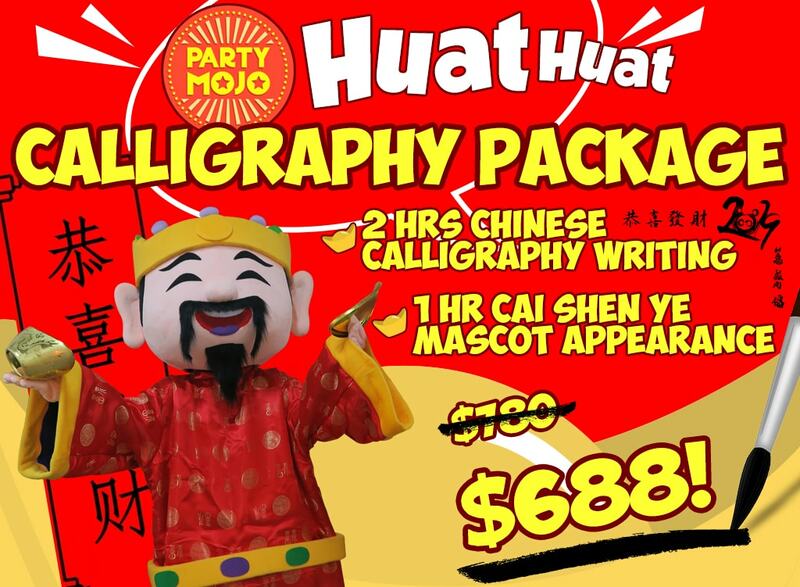 Introducing PartyMojo’s Huat Huat Calligraphy Package that was highly requested! Enjoy 2 hours of Calligraphy by our master! Handwritten smoothly on a piece of red paper in black ink, request from our Calligraphy master to write your name or 4-word Chinese phrases of blessings! 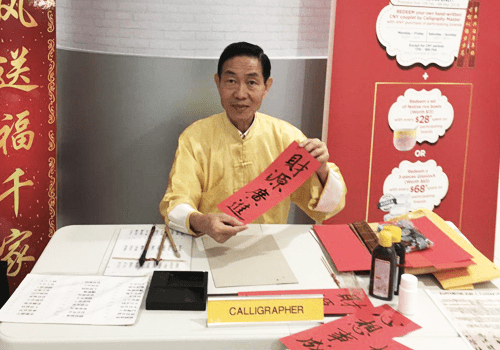 The Calligraphy master can write up to 50 pieces in an hour! Certainly a well-received activity for your guest and to start of the Chinese New Year! On top of the calligraphy activity, the package includes 1-hour of Cai Shen Ye Mascot and giving out 100 pieces of gold coin chocolates! 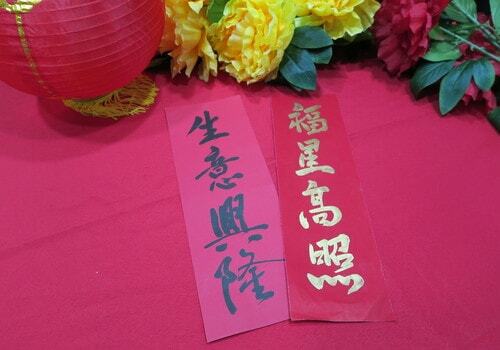 Cai Shen Ye will patrol around the premise to share fortune and spread joy to everybody! Hurry Book NOW! While slot last! Chinese New Year is around the corner and what better way to welcome the festive than loud drums and lion dance performances! If you’re in need of CNY entertainment to hype up your CNY events in this prosperous Year of Pig, PartyMojo is here at your service! 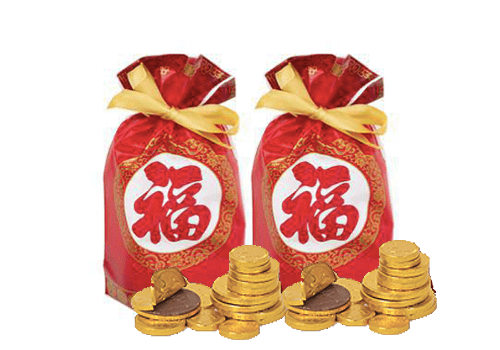 Invite the God of Fortune to spread prosperity and give out Ang Bao packet or chocolate coins! 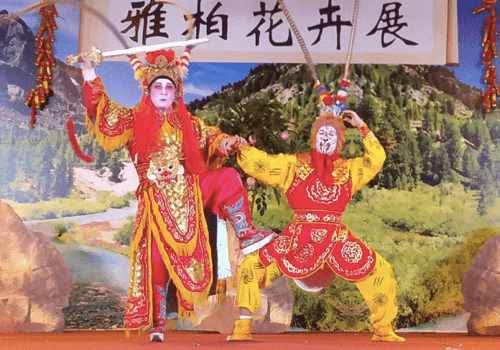 Get in touch with your root and witness Traditional Chinese Opera performance of the Monkey God vs Heavenly God! A fan of action performances? Then hype up the crowd with Wu Shu Performance! Experience the fascination before your very eyes! What’s a CNY without themed entertainment? PartyMojo offers CNY Themed Mascots Appearances! 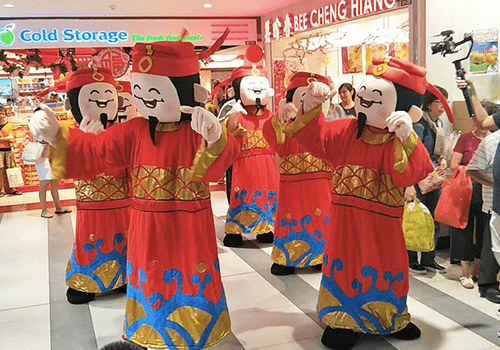 Choose from a variety of mascots including Cai Shen, Fulu Shou and many more! There is no better way to welcome the new year with Lion Dance! Invite a group of talented lion dance performers and drummers with experience to hype up your event! Includes a pair of lion dance and drummers! * Prices depend on the number of lion dancers and duration of the performance. Call to inquire more today! I would like to multiple dates and long hours, are you able to cater to my hours? We will require your interested performance date and timing to check our calendar for the availability. Please let us know your preferred timing in advance and we will check it for you! 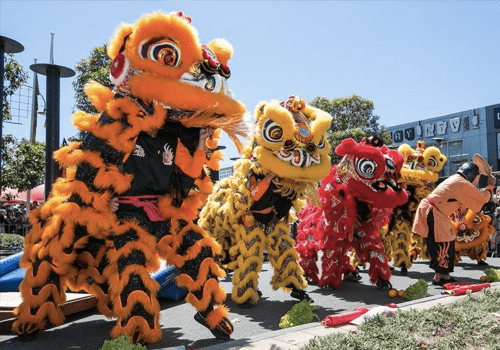 Do you have special Lion Dance performances? Other than the normal Lion Dance we are able to source for LED Lion Dance and also Dragon Dance! Subjected to availability! As our Chinese New Year Lion Dance Performance is on demand, we highly recommend you to book at least 2-3 weeks in advance to avoid disappointments! 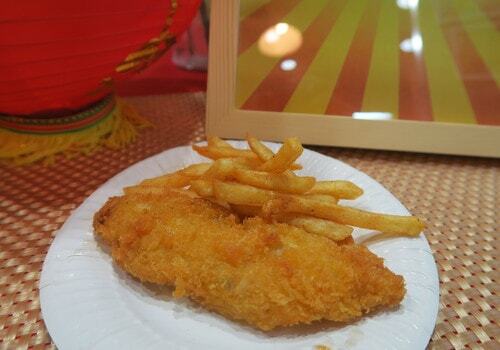 What’s Chinese New Year without our all-time favourite Cai Shen Ye! 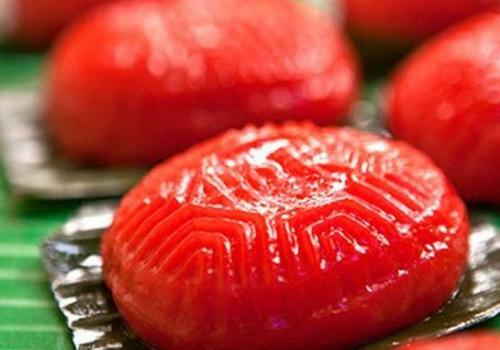 Invite the God of Fortune this Chinese New Year to huat the new year! We are able to arrange for the mascot to give out red packets or candies! Call to PartyMojo to enquire now! * Prices might differ during Chinese New Year Eve and Chinese New Year Day 1 and 2. I would like to book more than 1 hour, can I do so? Yes! Please let us how many hours are you looking at or how many appearances and we will quote you accordingly! Please note that our mascot requires breaks in between appearances. I am looking for more than 1 Cai Shen Ye, are you able to cater to that? Yes! 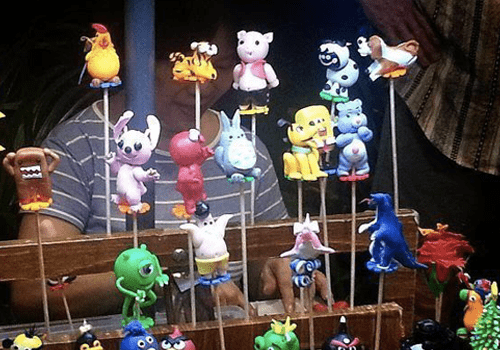 We once had an event that activated 13 of our Cai Shen Ye Mascots at once! As our Cai Shen Ye appearance is highly on demand, we highly recommend you to book at least 2 to 3 weeks in advance to avoid disappointments. Fu Lu Shou is known as the Three Star Gods and the mascots represent happiness and prosperity, status and authority and health and longevity. 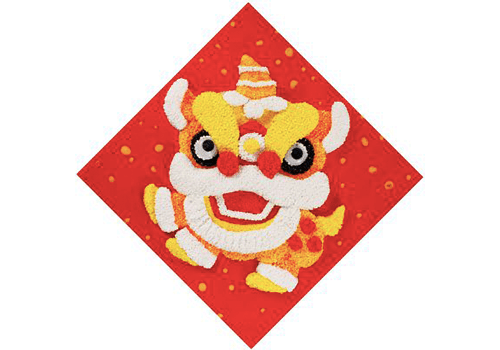 – Fu is the star god of happiness, prosperity and good fortune. Fu is the bringer of good luck. – Lu refers to salary. Lu gives blessings when taking difficult exams and help in gaining a successful career. Hence, Lu is the star god of social status! – Shou is the star god of longevity. He is often called the “Old man of the South Pole”. Legend has it that Shou Xing has the power to decide how long every human will live! – For all 3 mascots: Call in to enquire for special price! Yes! Please let us how many hours are you looking at or how many appearances and we will quote you accordingly. How much will it cost to book all three Fu Lu Shou Mascots? First-hour $840 and subsequent hour $300 for all three mascots! * Prices might differ during Chinese New Year Eve and Chinese New Year Day 1 and 2. Call to inquire more today! I would like to book longer than 30minutes, can I do so? Our Si Chuan Bian Nian performance is fixed at 30 minutes per performance only! As our Chinese New Year Performance is on demand, we highly recommend you to book at least 2 – 3 weeks in advance to avoid disappointment. 10mins – Call in to enquire the price! I would like to book longer than 10minutes, can I do so? Our Chinese Opera performance is fixed at 10 minutes per performance only! Price: 4 Performances from – call in to enquire! * Prices might differ during Chinese New Year Eve and Chinese New Year Day 1 & 2. I would like to book more than 4 performers or longer timings, can I do so? Yes definitely! We are able to cater to more performers and timings! Let us know your preferred timing and date and we will help you check the availability! We highly recommend you to book at least 2 – 3 weeks in advance to avoid disappointment! 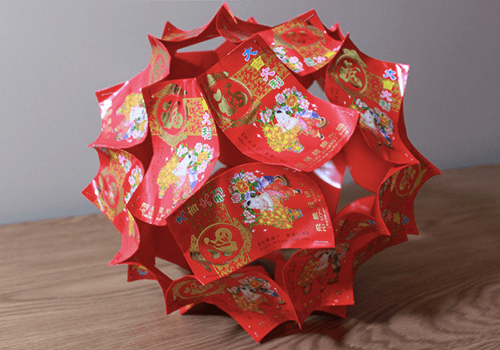 Using red packets, let parents and their kids make this beautiful lantern while at the same time, parents can teach them about the art of recycling! After which you can use them to spice up your home. All materials will be provided along with a friendly Mojo Staff to provide guidance! For 100pax and above, please contact us for more details. 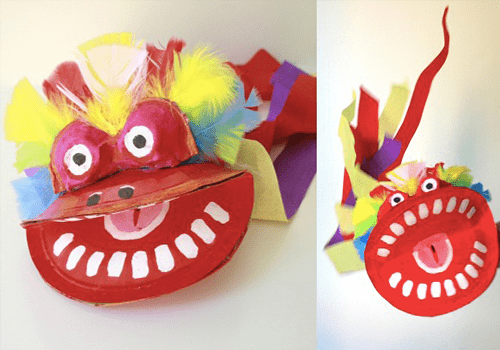 Make your very own Dragon Puppet with red plates, egg tray and colourful papers! Enjoy the many benefits of puppet play like stimulating kid’s imagination, improving motor skills and boosts confidence in speaking! All Art & Craft materials included with 1 PartyMojo staff to assist! Did you know that Firecrackers are set off during the CNY to scare away evil spirits and to celebrate the coming of the new year? Make your own firecracker with paper plates, red paper and strings! 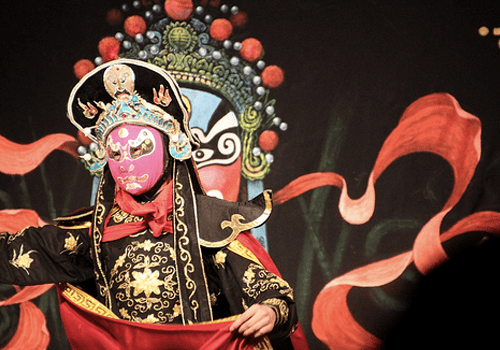 Chinese Opera has long been a part of Chinese New Year celebrations! 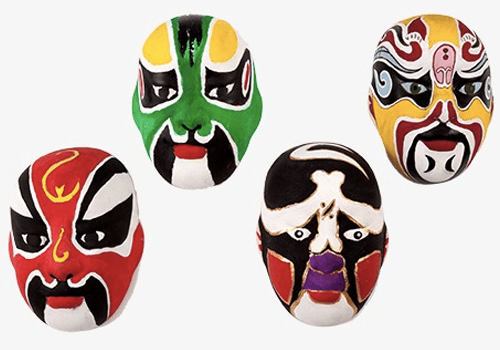 Take this chance to let kids be in touch with their roots with this mask painting craft! Sample designs and assistance will be provided! Yes definitely! The crafts are for kids and parents to bring home and admire! 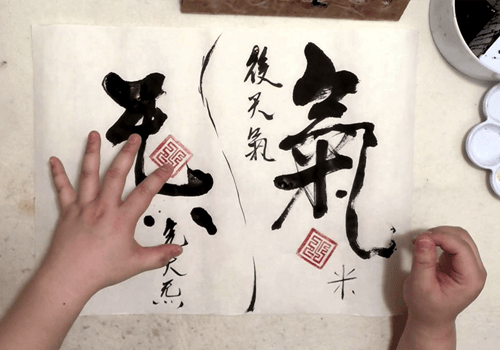 Chinese Calligraphy is a unique art form of the treasury of Chinese culture! This New Year, let the kids have a go at it and who knows? Maybe your child has a talent for it! 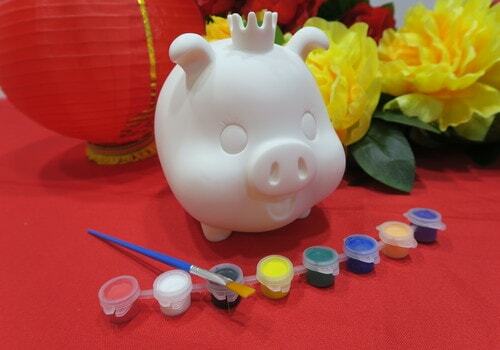 To celebrate the Pig Year, paint your very own ceramic pig coin bank! Unleash your kid’s creativity by painting it any way they want! Bring home the piggy coin bank and encourage your kids to start saving early! 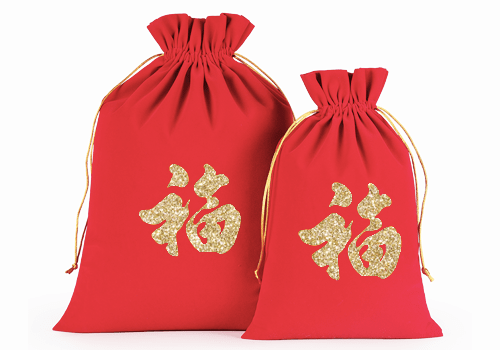 Have a go at painting your very own 福 Drawstring Bag! ‘福’ in represents fortune and good luck and by painting it upside down, it means good luck bestow on you! Kids can keep all the ang baos collected in the bag! Kids will adore rolling, squeezing, twirling, and pulling Foam Clay into 3D shapes on this lion canvas! Not only is this craft is fun to do. it cultivates the kid’s motor skills and patience while completing it! My guests are below the age of 4, are the art and crafts still suitable? Subsequent hour – Enquire with us! How many art pieces can one artist draw in an hour? One artist can draw up to 50 pieces in an hour for calligraphy and 25 pieces for Rainbow Calligraphy. I have 100 guests to cater for in an hour, can it be done? Yes absolutely! This can be done by adding on more artists (with a charge). Call our friendly event advisors to enquire today! What is required from me if I hire Calligraphy from PartyMojo? Simply provide us with 1 table and 1 chair and we’re good to go! Don’t worry, table rental are available at only $20! CNY Table Deco is available for a top up too! Contact us to find out more on the pricing! One artist can draw around 50 pieces in an hour! Yes absolutely! This can be done by adding on more artists (with a charge). Call our friendly event advisor to enquire today! What is required from me if I hire Fan Calligraphy from PartyMojo? Simply provide us with 1 table and 2 chairs and we’re good to go! Don’t worry, table rental are available at only $20! How many art pieces can one artist cut in an hour? It depends on the complexity of the paper cutting craft! We can cut between 70 to 80 pieces in an hour! I have 200 guests to cater for in an hour, can it be done? Yes absolutely! This can be done by adding on more artists (with a charge). Call our friendly sales staff to enquire today! Simply provide us with 1 table and 1 chair and we’re good to go! Table rental are available at only $20! How many art pieces can one artist make in an hour? One artist can make up to 50 pieces in an hour! 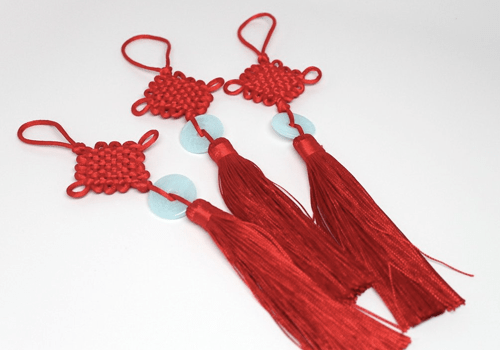 What is required from me if I hire CNY Knot Making from PartyMojo? One artist can make up to 20 – 25 pieces in an hour! What is required from me if I hire Dough Making from PartyMojo? Simply provide us with 1 table and 2 chairs and we’re good to go! Don’t worry, table rental are available at only $20! CNY Table Deco is available for a top up too! Can we really paint everything? Yes, everything and anything! 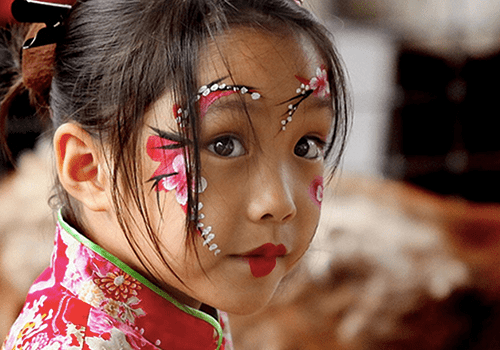 Since it’s the Chinese New Year season, we have also prepared Chinese New Year related face painting designs! How many kids can get their tattoos in an hour? Our artists can tattoo 15 to 20 kids in an hour. It takes 3 – 5 minutes to get one tattoo done, depending on the size of the tattoo and also the complexity of the design! 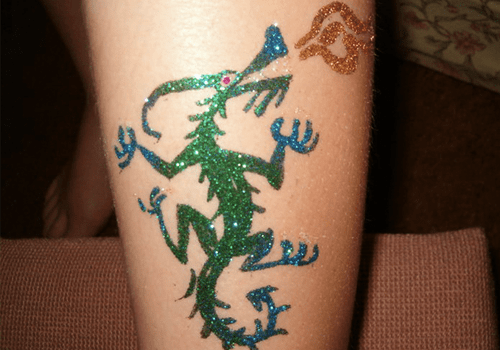 Glitter tattoo can last for around 3 to 7 days. It can be removed with scrubbing off. It is waterproof and durable on most occasion. You can still swim or shower with a glitter tattoo on. This also makes glitter tattoo extremely popular at pool parties! We will stick a vinyl stencil to the skin, apply a thin layer of body glue, followed by the glitter and lastly remove the stencil! All products used are FDA approved and hypoallergenic. The glue used to apply the tattoos is a gentle, non-toxic, latex-free cosmetic glue made specifically for use on skin. Glitter tattoos are available in all colors available! Only Flowers & Sword again? We know, we know. Countless time you saw these similar sculptures at friend’s or neighbour’s party. But classics never fail to entertain kids, akin to glistering eyes when kid meets candies. However, we always strive to work on these classics to be innovative! 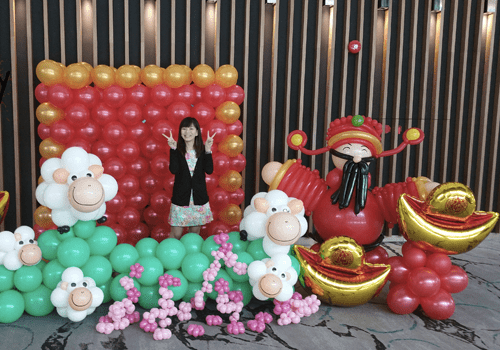 On top of this, we conduct interview and training for our balloon artists to make sure they are A-W-E-S-O-M-E.
Do you offer Chinese New Year Balloon Sculpting? Yes! We do provide Chinese New Year Themed Ballon Sculpting such as Yuan Baos, Dragons and Pigs! 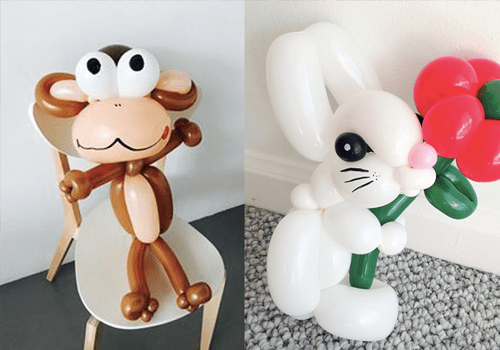 Simply ask out friendly balloon artist! Our artist will try to fulfil all requests to their best extent! 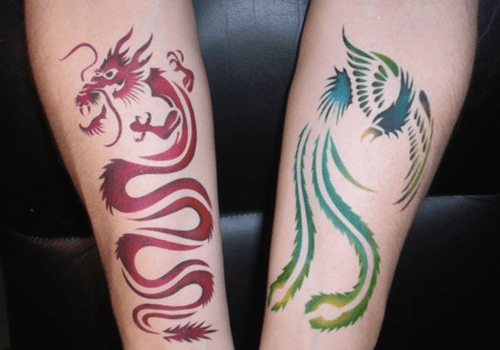 Airbrush tattoos are available only in black ink. How long will the airbrush tattoos last? They will last between 2 – 5 days. It can be removed with scrubbing off. It is waterproof and durable on most occasion. Though it had the same effect as a tattoo, however, the whole procedure is totally painless and safe. One artist can draw around 12 pieces in an hour! 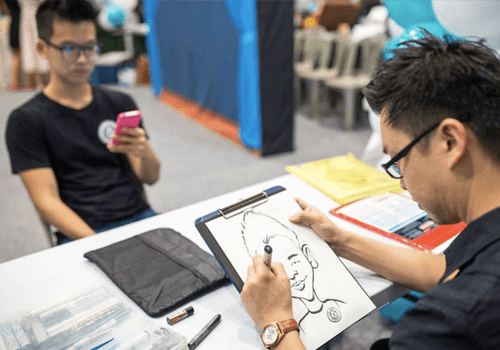 What is required from me if I hire caricature from PartyMojo? What better way to start the new year than feasting with friends and family? This Chinese New Year, rejoice in the fest and feast! 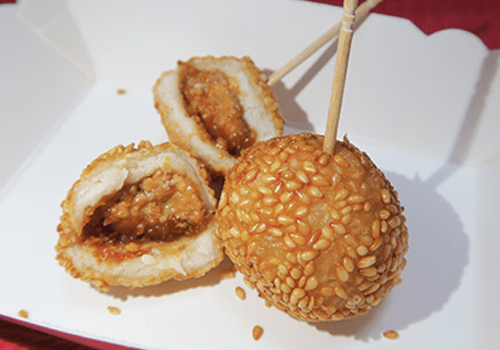 Your fete is not complete without PartyMojo’s CNY Fringe Food that comprises of the Golden Popcorn for prosperity, the super spun Fortune Cotton Candy, as well as CNY’s Limited Edition Fried Nian Gao, Pan fried Ang Ku Kueh, Spring Rolls and Sesame Ball! 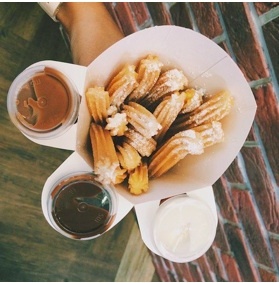 Feeling the sweet tooth yet? Call PartyMojo’s event advisors now to find out more! – One young and lively Mojo Staff to serve! * Top up $50 for Chinese New Year Table Setting! * Delivery surcharge of $30 is applicable for Changi, Tuas, Jurong Island and Sentosa. * Surcharges may apply for events held on Chinese New Year Eve and Chinese New Year Day 1 & 2. Is the Popcorn free flow? Yes! Popcorn will be free flow at your event! Please let us know the estimated number of attendees in advance! Do the live stations come with Chinese New Year Decorations? The station does not come with Chinese New Year Decorations! If you are interested to have Chinese New Year Table Setup for your live stations, simply top-up $50 and please speak to our event advisors! Are the popcorn Halal certified? All our ingredients are Halal certified! How many bags of popcorn can you produce within an hour? 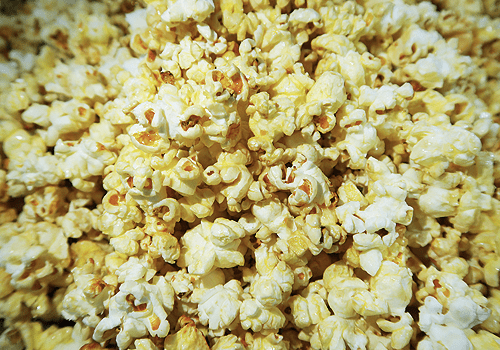 We can serve up to 100 bags of popcorn in an hour. If you have too many guests coming for the event, we can use a smaller popcorn bag so as to cater to more people! Are you able to do 2 hours for 1000 pax, what are the charges? 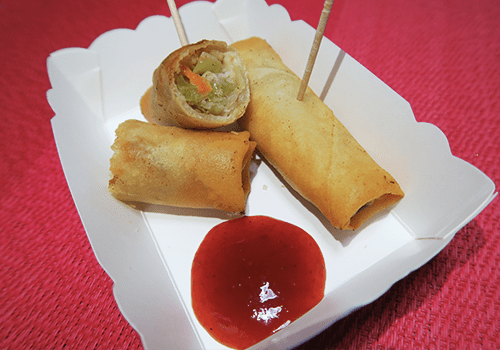 Do you have more Chinese New Year Live Food Stations? Yes we do! Contact us for more details! How many pax can you serve in 1 hour? We can serve up to 80 pax per hour! 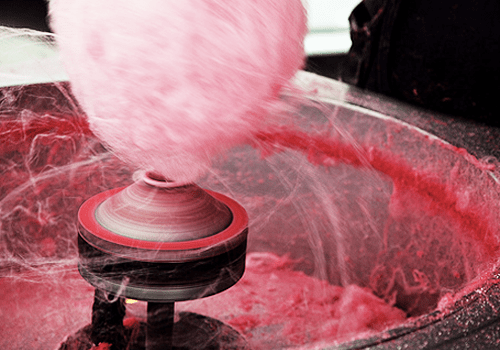 What’s required from me if I hire PartyMojo’s CNY Candy Floss Station? Simply provide us with a table and a 3 pin power socket we’re good to go! 年年高 – To have a higher income or position in this new year! 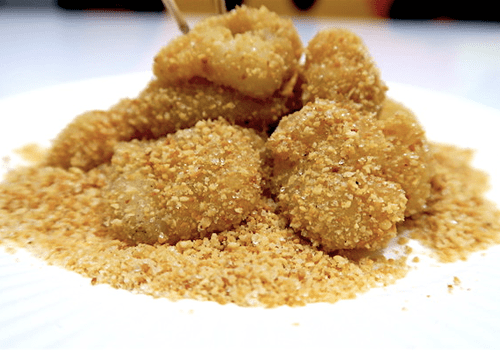 How many Deep Fried Nian Gao can you serve in an hour? 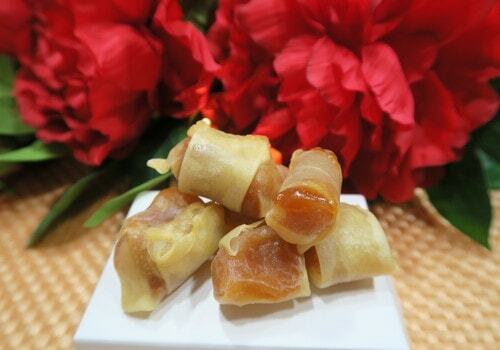 We can serve up to 100 servings of Deep Fried Nian Gao in an hour! Are the Nian Gaos Halal certified? Yes! 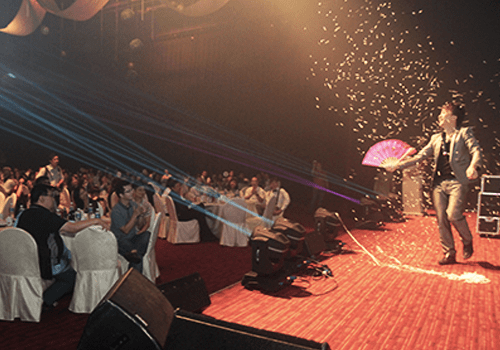 PartyMojo can go everywhere and anywhere in Singapore! However, for inaccessible locations like Sentosa, Tuas South and so on, a transport surcharge between $20 – $30 is applicable. For outdoor events, do make sure that a powerpoint is available. 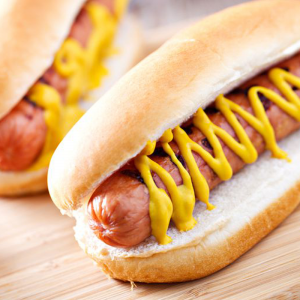 We can serve up to 100 servings per hour! We provide both Peanut and Green Bean Paste Flavoured Ang Ku Kueh! 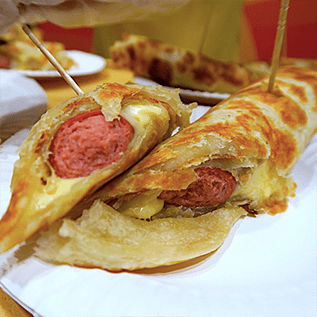 What’s required from me if I hire PartyMojo’s Ang Ku Kueh Station? 年年有余 – To have more than what you need! 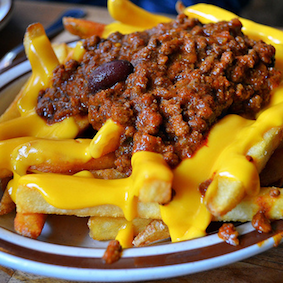 Are the food Halal certified? 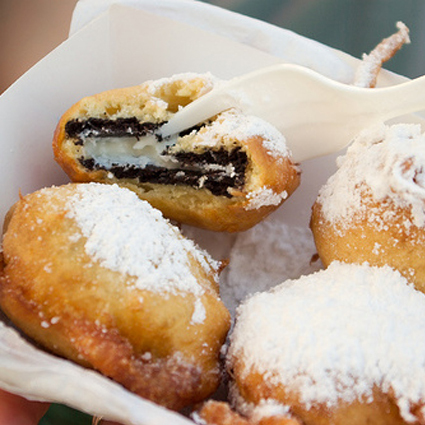 How many servings can you serve within an hour? 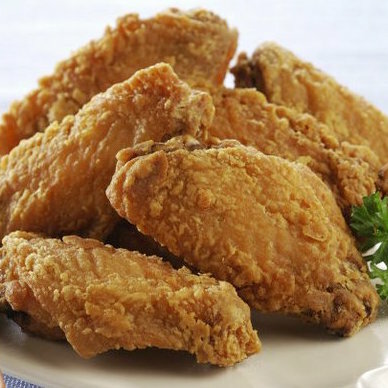 We can serve up to 100 pax within an hour! 黄金万两 – Lots and lots of Wealth! We can serve up to 100 pax per hour! 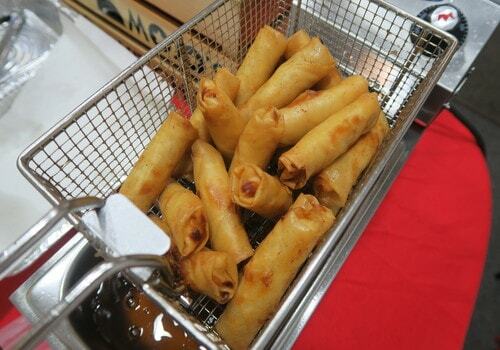 What’s required from me if I hire PartyMojo’s Deep Fried Spring Roll? 扩大财富 – Expand your fortune! 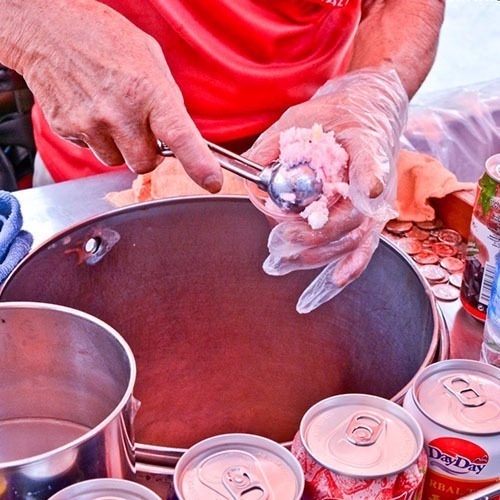 Are the food stations Halal certified? 步步高升 – May you rise steadily! * Top up $50 for Christmas Table Setting! A small table for us to place the machine if tables/carts are not included in your package. Does it include delivery and manpower? Yes! All prices as above include delivery, set up, manpower! Not only that, young and lively staff will be at your event to serve and punctuality is guaranteed! Are the Ingredients Halah certified? Yes absolutely! All our ingredients are Halah certified! Yes, we will require a table to place a machine. Otherwise, tables are available for hire at only $10! My event is outdoors, can I still hire the station? Yes! PartyMojo can go everywhere and anywhere in Singapore! For inaccessible locations like Sentosa, Tuas South and so on, a transport surcharge between $20 – $30 is applicable. For outdoor events, do make sure that a powerpoint is available. 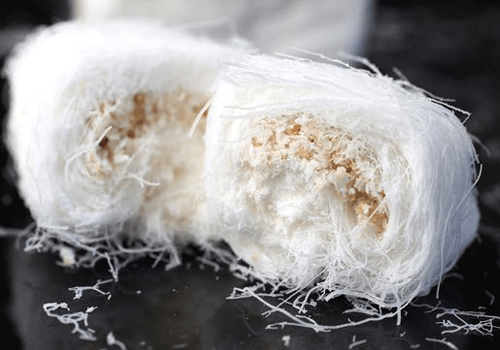 龙马精神 – To be full of spirit and vigour! 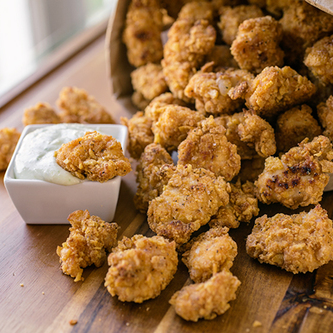 How many servings can you make within an hour? 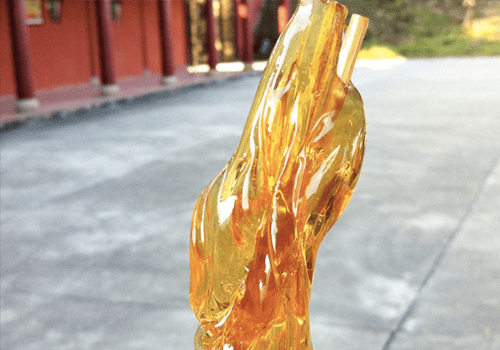 甜甜蜜蜜 – Relations as sweet as honey! What’s required from me if I hire PartyMojo’s Chinese New Year Malt Candy? Contact us @ [email protected] to receive PartyMojo’s CNY Catalogue! Need more options for your Chinese New Year Party? 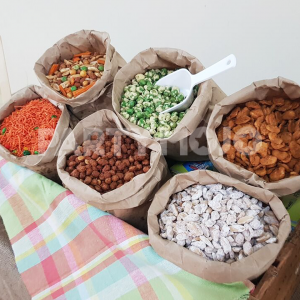 Click here for a wide range of food stations! Call now to enquire! 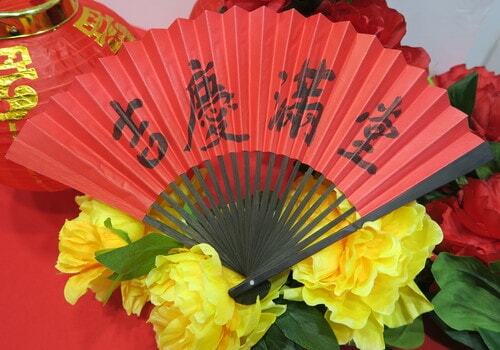 The one-stop destination for your Chinese New Year decoration needs! Create the Chinese New Year festive vibe event this year with our decoration packages that will definitely brighten up your function rooms, office pantry and even open spaces! 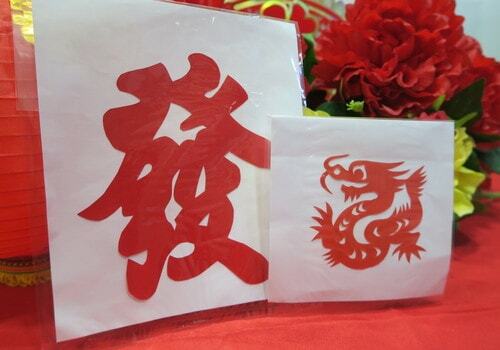 2 types of Chinese New Year Decorations for you to choose from! Enquire with us today! Balloon decoration is a must-have mood setter for any celebration! 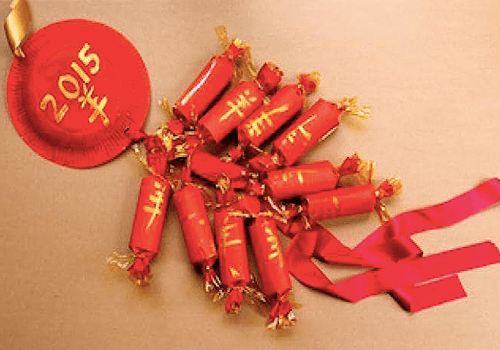 Induce the Chinese New Year vibe with these balloon decorations! Need something else? Ask us today! What’s the size of the balloons decoration package? 3m (W) x 2m (H) x 2m (D). What material is the balloons made up of? What colours do you have for the round balloons? We have a variety of colours for you to choose from! Call us to check out our latest colours! When will my balloons be inflated? Latex balloons will be inflated 1 hour before collection/delivery! Will the balloons burst easily due to temperature changes in the room? We inflate our balloons to about 95% of its capacity to allow hot air expansion. Will my balloons stay inflated longer in air-conditioned room? Yes! Usually, helium balloons can stay inflated for up to 10 hours in air conditioned room. However, for non air-conditioned / outdoor, the balloons can stay inflated up to 7-8 hours only. How do you pack the inflated balloons? They will be placed in large plastic bags! This is to ensure our delivery man can transport them easily and also longer inflated time. 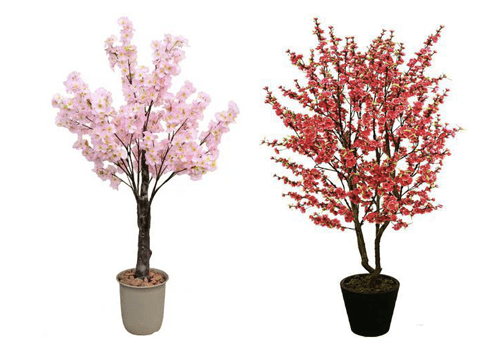 Cherry blossoms are a symbolic flower of the spring, they represent Romance, Prosperity and Growth. Contact us to find out more about designs and pricing! *Prices depend on design and conditions of the environment. Call to inquire more today! 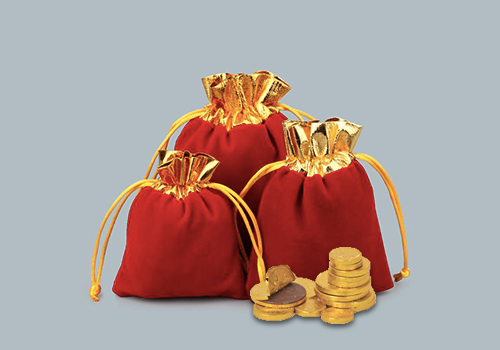 This year’s Chinese New Year Goodie Bag is a pouch filled with kid’s ultimate favourite; Chocolate Gold Coins! View FAQ for more details! For Pricing, please contact us to receive the quotation! * Please book with us 3 weeks in advance! For bookings made shorter than 3 weeks notice, Goodie Bag items may differ and surcharges applicable. Can I order just your Chinese New Year Goodie Bag? Definitely! However please note that we have a minimum order for our goodie bags! If you want to customise your own goodie bags, speak to our friendly Event Advisors to find out more! Is there a minimum quantity for the Chinese New Year Goodie Bags? The minimum quantity is 20! Do I need to book in advance for Chinese New Year Goodie Bag? Please book with us 3 weeks in advance! For bookings made shorter than 3 weeks notice, Goodie Bag items may differ and surcharges applicable. If I want to include my own items in your Chinese New Year Goodie Bag, are you able to help me with the packing? Yes, we are able to help you with the packing. However, please send us the item at least 2 weeks in advance prior to the event. Also, please note that packing charges may apply. Contact us for more details! Duration: 30 mins of Award-Winning Live Animal Magic Show! Subsequent hour – Call to enquire! Can I choose emcee for my event? Yes of course! We will provide you with different portfolios to choose from. Can I have special request for the emcee? Yes you can! However, do give us a call to check first! I’m interested! Do I have to provide anything on my side? Simply provide our emcee with a microphone and sound system! Our sound system is also available for rental! How early in advance do I have to book the Emcee? 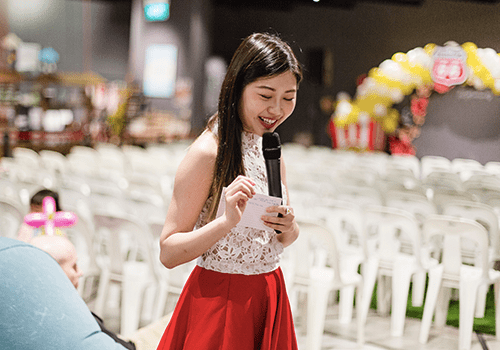 It’s recommended to book the emcee as early as possible especially for popular dates like national day, christmas, new year and so on. Simply click on the buttons below and we will get back to you shortly!